Gothtober Quinceañera Day 10 with Moonhouse Productions! artists, Original Music Comments Off on Gothtober Quinceañera Day 10 with Moonhouse Productions! 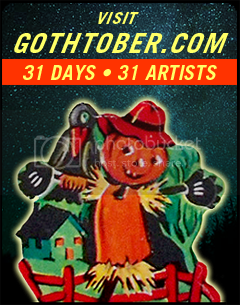 Visit www.gothtober.com and click on DAY 10 to see quite the party from Moonhouse Productions! Day 10 is brought to you by Moon House Productions, also known as Paprika Clark and Emily Hansen. Emily and Paprika are multi-talented creative types. They met after college and have known each other for over 20 years – but they never played with dolls together until they brainstormed the idea for their Quinceañera-themed Gothtober project. 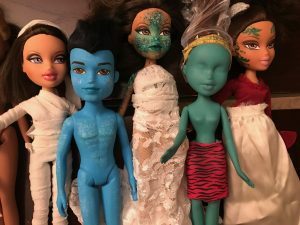 The characters starring in Dia de La Quinceañera started out as previously loved Bratz and Monster High dolls tracked down on Ebay and garage sales. Each was carefully auditioned and screen tested, then hand painted and costumed in (mostly) custom made clothing. The Moon House crew managed to spend weeks designing the characters and crafting the look and style of the film without dancing the dolls around and talking for them…. Much. 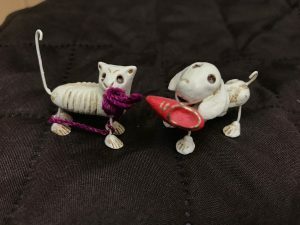 In the end our favorite character ideas were the ones that filled out the film as background artists – the Ghost of Frida Kahlo and our Dia de los Muertos figure, who are both at the party repping the ancestors. Long live our honored forebearers! 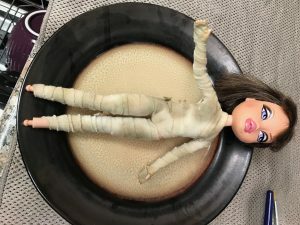 After many layers of artist’s acrylic paint and Mr. Super Clear sealant and some strategic use of polymer clay, the dolls were ready for their closeups. Emily’s son, Trenton, improvised and performed the musical score, and Emily put her magical effects and editing skills together to make the gem you see before you. Find out more about Moonhouse Productions and other Gothtober contributor bios are here!